If you're looking for a great deal on a tablet, Amazon's Fire tablets are definitely worth your consideration. Even at list price, each of the models available offer exceptional value. Whether you want the top-of-the-line 10-inch model with an HD display or the unbelievably cheap 7-inch edition, each Fire tablet comes with Alexa, Amazon's super helpful virtual voice assistant. These tablets let you play games, shop online, check email, take photos, listen to music, and more - all in an incredibly portable and incredibly affordable form. It's the sensible option for anyone who wants a tablet but doesn't necessarily 'need' one. 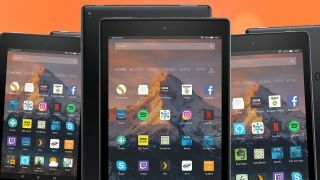 Below you will find the best prices on each of the Amazon Fire tablets; be sure to check back often, though, as they are frequently discounted. The least expensive of Amazon's Fire tablet, the Fire 7 is available at impulse-buy price level. It doesn't have an HD screen, but it does comes with Alexa, the virtual assistant from the Amazon Echo devices. You can also have different profiles through Amazon FreeTime so it's possible to share among different members of the family, although at such a low price, there's no reason not to get more than one. For a startling low price, the Amazon Fire HD 8 is one of the best tablets around, especially if you're already tapped into the Amazon ecosystem. An 8-inch HD display and Dolby Audio will allow you to enjoy streaming content from Amazon's Prime video library and elsewhere, and the tablet comes equipped with Amazon's AI assistant, Alexa. The starting model has 1.5GB RAM and 16GB SSD, which can be expanded via the microSD card slot. Amazon gave the Fire HD 10-inch tablet a much needed overhaul in 2017, thankfully without raising the price. The cheapest model comes with 32GB of storage, has a full HD 1080p screen, and has 2GB of RAM to run even faster than before. In short, it's one of the best 10-inch tablets you'll find for such a price. And it comes equipped with Alexa as well. Got tech-hungry children? The Amazon Fire Kids Edition tablet is just the answer. It comes encased in an eye-catching and durable protective casing, but if that weren't enought, it has a two-year unrestricted guarantee. So even if the kids break it, Amazon will replace it no questions asked. It's equipped with plenty of software safeguards too to make sure they can only access appropriate content , and which allows you to adjust screen-time limits. Have more than one child? You can save when you buy a two-pack. As its name suggests, the Fire HD 8 Kids Edition is a bigger and better version of the Fire 7 Kids. It has a larger, 8-inch HD screen, and the mono speaker has been traded in for dual stereo speakers with Dolby ound. The battery has been boosted from 8 hours to around 12, and you get 32GB of storage instead of 16GB. Nevertheless, you're still getting that same tough build quality and two-year guarantee too, so you don't have to worry about it being damaged. Don't want your kids fighting over the tablet? You can save when you buy a two-pack. Not interested in a Fire tablet? Check out our other favorite cheap tablets.